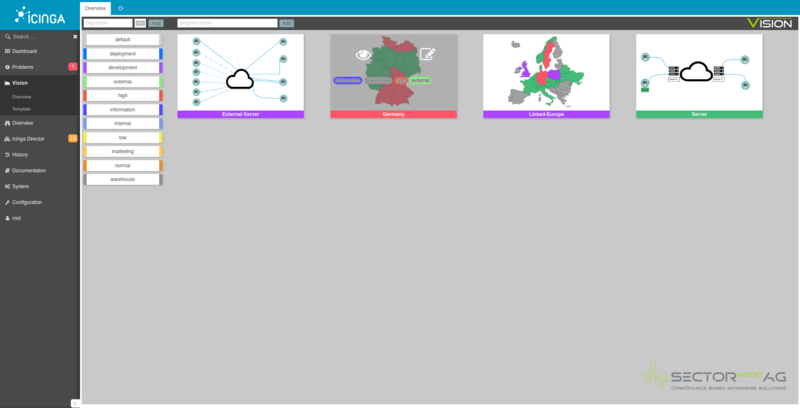 With "Vision" we have developed a module for the browser interface IcingaWeb2, with whose help you can easily create extensive graphics for your ICINGA2 monitoring. 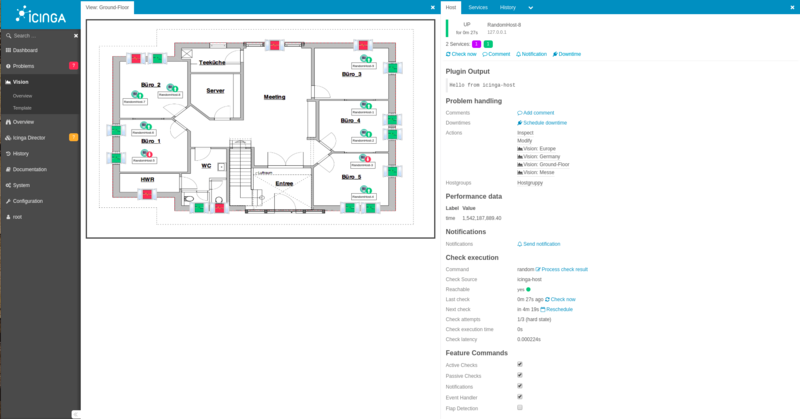 By the automatic filling with the appropriate status values you are able to convert the data available in Icinga2 visually and to evaluate so clearly better. 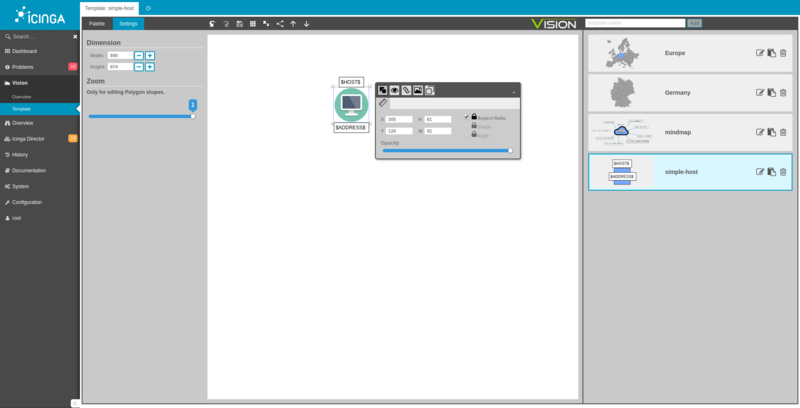 Vision serves as an editor for the creation of so-called diagrams, which you can design as you wish. 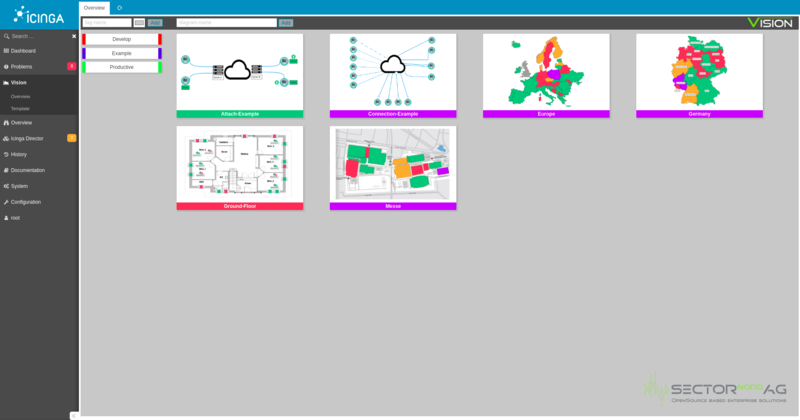 Examples would be the world/ Europe map or the floor plan of your company building. 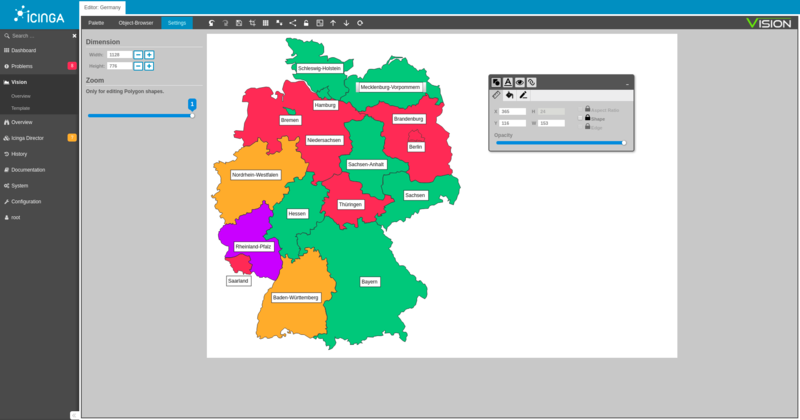 These maps can be extended with the live status values provided by Icinga2. 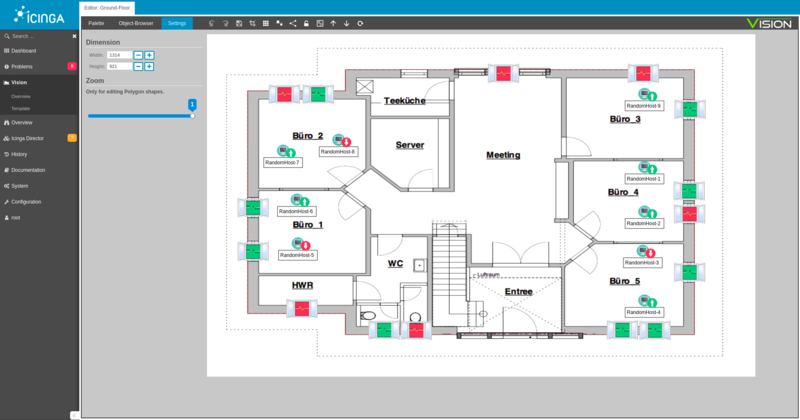 Vision allows you to place hosts and services on the chart according to your needs, allowing you to see problems or failures at a glance. 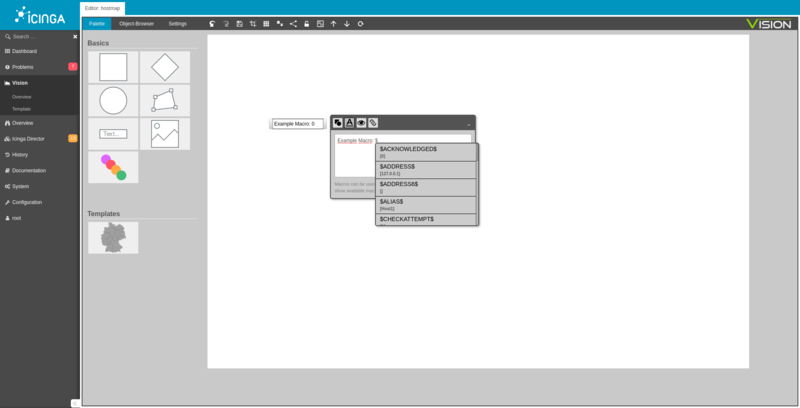 Diagrams created can also be displayed as widgets on your dashboard. 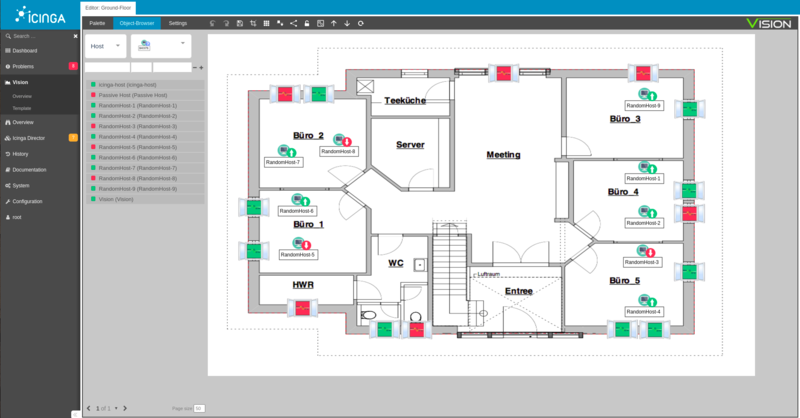 The editor is the basis of Vision, it allows the creation of diagrams. The diagrams are maps/images on which the individual host and service objects are placed. 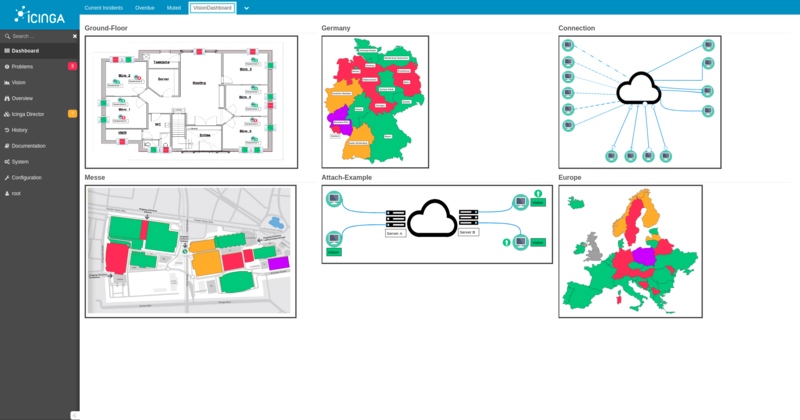 With the help of the editor you can graphically display your IT infrastructure and thus see failures or problems at a glance. Objects can also be merged into templates, see below. 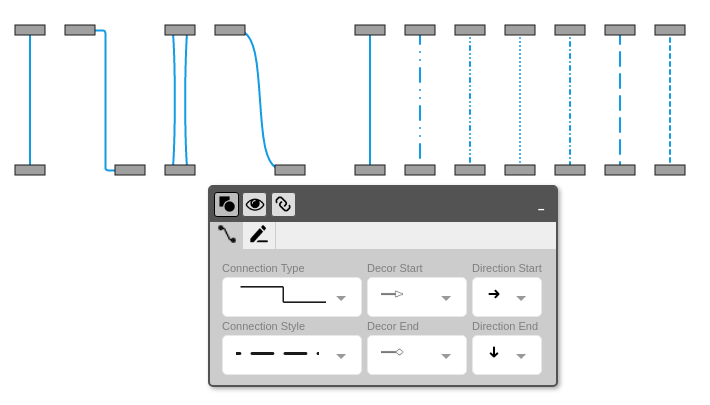 All objects and templates can be linked with connecting lines. 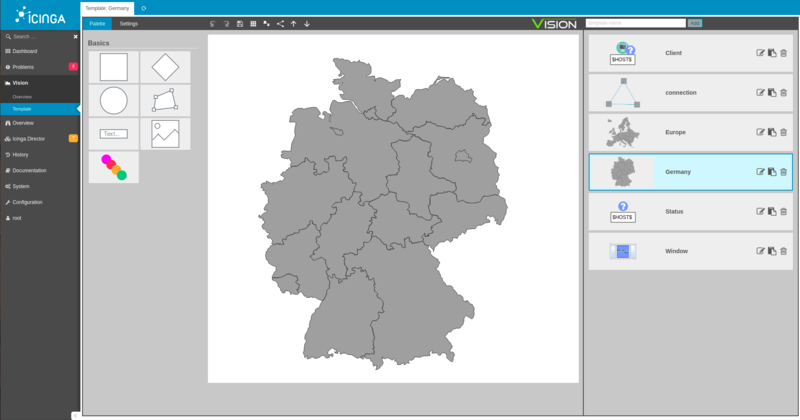 The core feature of Vision is linking objects and connecting lines to hosts and services. Hosts and services can either be placed on objects by dragging and dropping them from the Object browser, or they can be linked using the context menu. 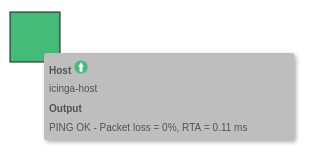 These objects always display the desired live status from the Icinga 2. The editor has many editing functions. 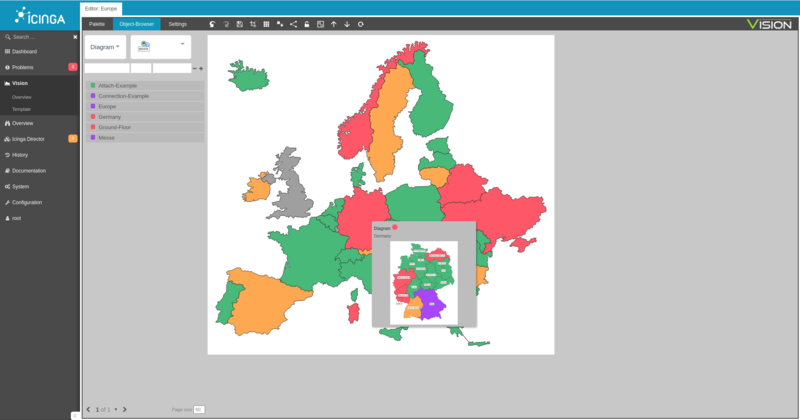 Among them, it offers the possibility to adjust the canvas size to existing elements via a crop function. There is a grid mode that displays an auxiliary grid and allows the user to align the objects with this grid. Furthermore, the editor has the function to group objects together, and the Undo/Redo function can be used to undo editing steps. 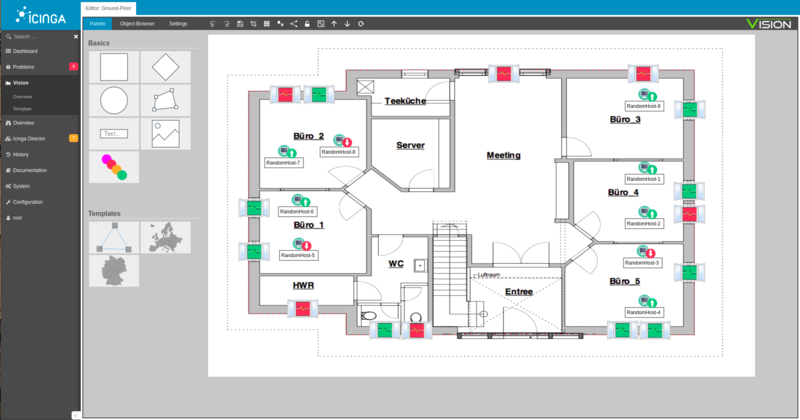 With the help of a front/back button, individual diagram elements can be lifted into the foreground or background. Vision enables the creation of templates. 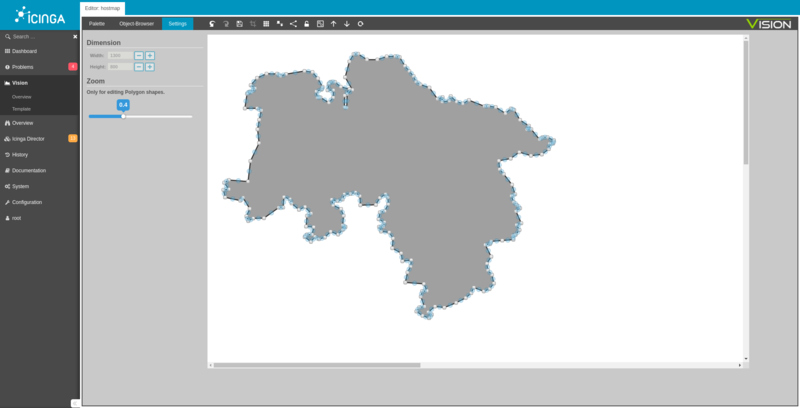 Templates are objects that consist of your own images or the objects of the palette. A template can be used as a template for the diagrams. Thus, Vision makes it possible to use objects once they have been created over and over again. The special zoom function for creating polygons in Vision makes it possible to display objects in great detail. These objects can later be filled with live status information and change their color according to the current status of the host, e.g. Up, Down, Unreachable, etc. Each label (text field) can be given all information of the host about the input of macros. Diagrams can be tagged to make them easier to find or classify. These tags can be easily created using the tag list on the left and dragged and dropped to the diagram. In addition, this tag list can be used to filter diagrams that are assigned to a specific tag. Diagrams can be linked to objects on other diagrams. 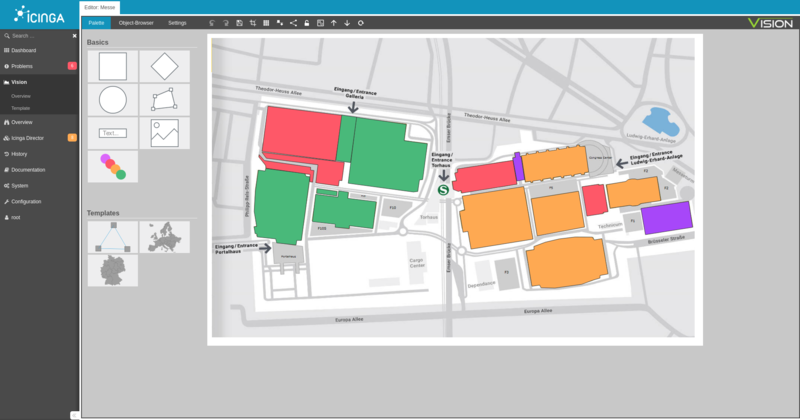 A tooltip shows the status and a preview of the linked diagram. 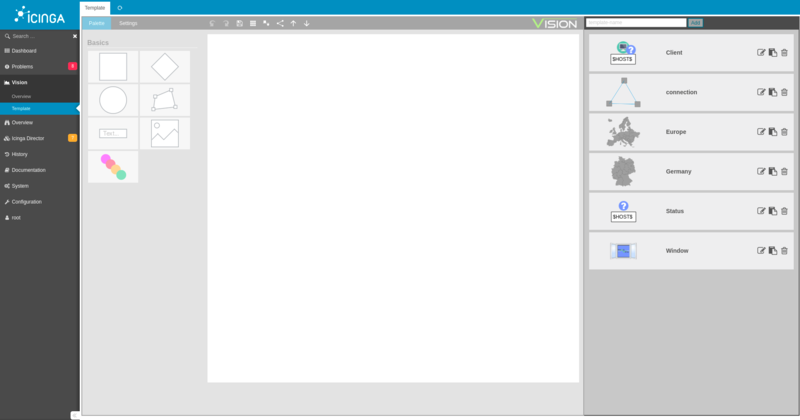 The basic requirement for using Vision is PHP 7, Icinga Web 2 and Chrome or Chromium as well as all current browsers.